We discuss the space probe! "Some dude totally thought that would be awesome," I say, as we eat dinner out at a local dining establishment. "The NASA guys were sitting around drinking one night," the DNB supplies. "Dudes, DUDES! You know what would be TOTALLY RAD? If we built something and then like, CRASHED IT INTO THE MOON! And $75 million later, here we are." The DNB shakes his head. "I mean, how many people are there in America?" I ask him. "Maybe 275 million," he replies. "Ok, so imagine if we took that $75 million and gave some to everyone in America." I do the math quickly in my head. "That's what, like $250,000 to each person?" "You mean, a quarter?" the DNB asks. "Yeah, a quarter of a million dollars," I say. "Imagine what people could do with that kind of money." Yes we can! The DNB puts his head on the table, which I have learned is a TERRIBLE SIGN. I can see his shoulder shaking. "A quarter of a million dollars?" he asks, making sure he's heard right. "Well yeah. Because if there were 75 million dollars and 75 million people, there'd be a million for each of them." "A MILLION FOR EACH OF THEM, BABY?" he asks in that incredulous way he does when he thinks I'm wrong and he's right. "75 and 75 and then you add back the million," I reply, confidently. "75 million divided by 75 million is ONE!" he nearly shouts. "Right," I say. He looks relieved. "One million." "NO! Just ONE!" He's getting more and more emphatic. "You really need to be adding back that million." "Is this how our national deficit got so big? Because Congress does math like you do? How did our debt get to be 987 trillion dollars? We thought it was $75 million!" He pauses, thinking. "Okay, let's do it this way. Say Johnny is sent to the grocery store." "Johnny goes to the grocery store. He has $75 million. He asks how much potatoes are. If the potatoes are $1 each, how many potatoes can he buy?" "First of all, $75 million? Can we call him Bernie Madoff instead?" "Fine. If Bernie Madoff has ripped off 100 people out of $100 each, how much has he ripped off of each person?" "What?! You just asked me if he rips off 100 people for $100 each, how much has he gotten from each person. That's a trick question." "You're making this way too hard. $75 million and 75 million are equal. $1 million each." The DNB sinks back in his chair. "I'll tell you what. Get out of my house, go to community college, and LEARN SOME MATH. Then come back, and knock on my door 1 million times divided by 1 million times. If you get the right answer, I'll open it. And I swear to God if you knock 1 million times, I'll open it and punch you in the face." He breathes in deeply, then suddenly sits up in horror. "Oh my God, you do not do our taxes..."
Great story. 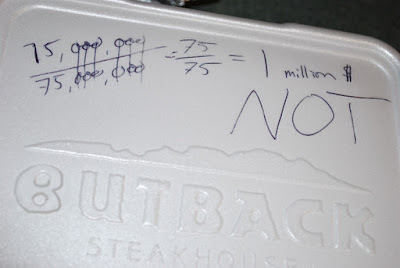 Did you modify the box from the steak house place that professes to be a taste of austrailia to say "Butback" in order to not copyright infringe? YOU TOTALLY DID!! I just clicked on it to enlarge. Nice photoshop job. The DNB is going to be SUPER EXCITED that someone noticed that. He was very proud.